In my earlier post I had informed readers about the sad demise of Shah Behram – the Bhagarsath Anjuman’s Varasyaji in Mumbai and the significance and importance of this majestic religious instrument in our religion. In the same post I had also noted that the Bhagarsath Anjuman had kept a spare white bull to be consecrated as and when the need arose. After the death of Shah Behram, the spare bull, called Varzavand, was expected to be duly consecrated as the spiritual heir to Shah Behram. Unfortunately, the spare bull developed a skin infection which resulted in some fungus forming on its body. The fungus had the appearance of a black patch. Although leading veterinary doctors were consulted and they opined that the patch would disappear in due course, as a matter of abundant caution, the elders of the Bhagarsath in Mumbai decided to look for another bull which they could initiate. Thanks to the efforts of Ervad Asphandiar Dadachanji and his son Hormuz and other volunteers, a suitable bull was located at Amalner, near Jalgaon about 375 kms from Mumbai. This pure white bull had been kept by a butcher. When he was approached he agreed to give up the bull without taking any money, only requesting for another bull in exchange. Accordingly, another bull was obtained from a Parsi farmer living nearby and the young new bull was transported by Ervad Dadachanji in his station wagon to Mumbai, driving non-stop through the night. On reaching Mumbai the new bull was examined thoroughly by the elders of the Bhagarsath in Mumbai, including Dasturji Firoze M. Kotwal, Ervad Keki Ravji and others and was found to be fit and suitable for consecrating as Varasyaji. On instructions from Dasturji Kaikhusroo M. Jamasp Asa, the Dasturji of the Anjuman Atash Behram, the bull was taken to the Anjuman Atash Behram and handed over to young Boywalla Sahebs, Ervad Darayus Karanjia and Ervad Kaizad Kotwal for the consecration. After their own inspection and discussions with senior members of the Bhagarsath, the young bull was selected and it was decided to commence the consecration ceremonies from Roj Ram Mah Bahman, 5th July 2010. The ceremony to consecrate a new Varasyaji is spread over 6 days and is complicated and involves a lot of attention to detail and close supervision. Ervad Darayus Karanjia had consecrated Shah Behram himself many years ago with the senior Boywalla of Anjuman Atash Behram in those days, late Ervad Darabshah Masani. This previous experience, coupled with a detailed handwritten manuscript prepared by another very senior Boywalla, late Ervad Kersasp Kotwal (late brother of Dasturji Firoze Kotwal), as well as the close supervision and guidance of Dasturji Kotwal, Ervad Asphandiar Dadachanji (who had also consecrated a Varsyaji many years ago), and Ervad Keki Ravji (who has also consecrated a Varasyaji in Navsari), made a formidable combination to ensure that the ceremonies were performed authentically and with a close eye to detail. It is difficult to explain the detailed ceremony in terms understandable to a layman. However a short description is attempted below. 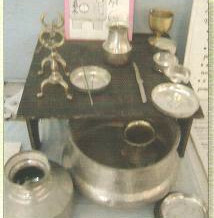 Several new implements are consecrated for this ceremony, including 7 new copper fulias, a copper or brass comb, metal scissors and metal tongs (sansi in Gujarati, as are used to grip hot vessels in the kitchen), a gold or silver ring and new clothes for both the priests. Firstly the new bull is got inside the Atash Behram premises and washed thoroughly. The hair of its tail is washed and cleaned with soap and water and then the hair is combed using the newly consecrated metal comb. Thereafter, the Mobed Sahebs begin their preparations by performing the small Khub and then making preparations to perform the Yazashne (Yasna) ceremony, by getting the ritual requirements like goat’s milk, twig of the pomegranate tree, a leaf from the date palm etc. Thereafter they ritually purify the scissor and tongs and approach the new bull, which is tied in a nearby pavi. The bull is made to stand facing the east, while the priests stand facing south. One of the priests holds up the tail of the bull using the tongs, while the other ritually purifies and sanctifies the tail and hair by reciting appropriate Avesta formulae. Then holding the new gold ring in his left hand and the purified scissor in his right hand, the priest takes three strands of hair from the bull’s tail and ties them around the ring in his left hand, while reciting the necessary formulae. Then tying the hair around the ring once, he cuts the hair from the tail with the scissor in his right hand and puts the scissor back in its special plate. Then using both hands he ties the two knots in the hair as is done while tying the Kusti and recites the necessary formulae. Having done so, the ring is put in its specific fulia. Thereafter the priests return to the main Pavi area where the ceremony will be performed. One of the priests then lays out the Hindola with all the ritual apparatus which is needed in the appropriate manner, specially one fulia in which a pinch of the Bhasam (sacred ash of the Atash Behram Saheb which is taken out in the Ushahin Gah in a secret ceremony) and some water is poured. The other priest gets the fulia in which the ring with the newly wrapped hair is put and the sitting priest takes out the ring and holds it in his hand. The standing priest puts back the empty fulia in its place in the Taak (hollow place in the stone wall where other apparatus is stored.) and gets the purified tongs in his hand and approaches the sitting priest, who puts the ring into the tongs such that it can be properly gripped. Now taking the ring in the tongs, the priest takes the fulia with the Bhasam and water mixture and approaches the fire. Putting the fulia on a hot ember the priest swirls the ring tied with the hair of the new bull in the fulia, reciting 1 Yatha Ahu Vairyo. He then returns the ring to the sitting priest and removes the fulia from the fire and places it on a stone nearby. Meanwhile the sitting priest holds the ring in his right hand and reciting appropriate prayers ritually washes the ring in each of 5 new fulias which are arranged in a line on the stone Hindola on the right hand side. In the last fulia he vigorously scrubs the ring with his fingers to ensure that no Bhasam is stuck to it. The standing priest gets back the empty ring fulia from the Taak and the sitting priest puts the washed and scrubbed ring back into it, which is then returned back to the Taak. Thereafter both priests step outside the pavi and finish off the requisite prayers to finish the Baj. Then all the ritual implements are washed and cleaned again with well water which has been filtered through a cloth. Then the Paragna ceremony is performed which ritually purifies and sanctifies each of the different Alat used in the Yasna ceremony. The Paragna begins by sanctifying and energising the Alats which are placed in the Kundi next to the Hindola. To do this, the priest takes the new ring, around which is wrapped the three strands of hair of the new bull and after ritually washing and cleansing it with appropriate formula, holds it in his right hand and placing the ring in the water filled Kundi, recites the 101 Names of God, ten times (i.e. a total of 1010 names). While reciting the names, the priests gently vibrates the ring in the water filled Kundi so as to send powerful reverberations throughout the Kundi. Thereafter both priests perform the entire Yazashne ceremony which involves the recitation of the 72 chapters of the Yasna, accompanied by due ritual. Once the entire Yasna is recited and the ceremonial water of the ceremony is merged back into the well from which the water to perform the ceremony was taken (known technically as ‘Jor melavvi’), the priest untie and discard the hair wrapped around the ring. This whole procedure is known technically as ‘performing the first Gevra’. Both priests now retire to a room in the Atash Behram and have to maintain strict rules of purity, taking the Baj for all occasions of daily need and eating food cooked in a ritually pure manner after consecrating Baj. On the second day, the entire ceremony described above is repeated, taking fresh hair from the bull, performing the hair cleansing ritual with the Bhasam and fire, doing the Paragna and performing the Yasna. Once the Yasna is finished, the hair used in the second day is also discarded. Thus finishes the ‘second Gevra’. In the same manner, the priests perform 6 days of identical ceremonies, while maintaining their Khub and Gevra. Finally on the conclusion of the ceremony on the sixth day, both priests consecrate separate Bajs, and then do the Chasni, placing a tiny bit of the Daran and the ghee in each other’s mouths, thereby showing that they have both attained ‘Ham Kalaam’ i.e. both their spiritual potencies have increased to the maximum possible level and both are now equal and qualified to proceed further. Thereafter, both priests approach the new bull with the scissors, tongs and a metal plate. One priest holds up the tail of the bull with the tongs, while the other washes and cleanses the tail with ritual formulae. Thereafter taking the appropriate Baj, the priest cuts off a majority of the hair of the tail leaving a few behind. Finishing off the Baj, the priests come back to the Pavi area and place the plate with the cut hair of the bull between the fire and the Hindola and ritually dry the same. (In olden times, the drying process was accompanied by a Yazashne ceremony but this was not done) Once the hair is dry, it is placed in specially made and purified small copper boxes which are then placed in a small bag made out of a priest’s Padan (mouth veil). In this manner, after 6 days of back breaking labour, intense ceremonies, hours of Avesta Manthra recitals and faultless ritual, the new bull is now consecrated as a Varasyaji. The hair taken on the final day is now used to create the Varas ni Viti which will be used in all the Yazashne ceremonies done from that day onwards. The entire ceremony is concluded with a thanksgiving Jashan, to offer grateful thanks to the Creator Dadar Ahura Mazda for allowing a new Varasyaji to be consecrated so that the rituals which had stopped in the days following the death of the previous Varasyaji can now be resumed. What is the real meaning behind these detailed rituals? As I had explained in my earlier post, normally the hair of any human or animal is classified as Nasu – dead matter. However, the Varasyaji, because of its rare and spiritually advanced pedigree is on a different plane altogether. Its presence is a must in all ceremonies as it represents the cream of the animal kingdom. However, it is not possible to have a Varasyaji present physically for every ceremony which happens at different places at the same time. Therefore, the hair of the Varasyaji has to be exalted to such an extent that it becomes a virtual Varasyaji is every ceremony. The rituals spread over the 6 days of Gevra and Yazashne are a Manthric purifications and energizing of the hair of the Varasyaji, such that even when the hair is removed from the body of the Varasyaji, it maintains the spiritual connection to the Varasyaji for years together, through the Fire energy of Atash Vohu Friyan. The ceremonies of Gevra, cleansing the hair of the Varasyaji with the Bhasam of the Atash Behram Saheb and the heat of the Atash Dadgah, coupled with Avesta Manthras and the spiritual power of the priests all combine to generate a formidable force which binds the vibrations of the Varasyaji with its hair forever. This spiritual connection or Paiwand is broken only when the Varasyaji passes away, at which point a new animal needs to be found and the spiritual kingship of the Varasyaji transferred to the new bull. The performance and holding of the Gevra also further strengthen the spiritual connection of the bull with Burjis – the celestial force behind the planet Jupiter which had played such a vital role in giving birth to the bull with these special properties. Thus on Roj Ashtad Mah Bahman, Saturday 10th July 2010, the new bull from Amalner was duly consecrated as the new Varasyaji Varzavand, to be the spiritual heir and successor of Shah Behram. This solemn ceremony was duly concluded in the presence of Dasturji K. M. Jamasp Asa and other senior members of the Bhagarsath Anjuman. After the ceremony, Priests of Agiaries having a spiritual link to the older Varasyaji came forward to collect the rings with the hair of the new Varasyaji and proceeded to their Agiaries to restart their own rituals. Dear readers, a miracle has taken place in front of our eyes and the community has not even blinked! Consecrating a new Varasyaji is a momentous event, one which needs to be celebrated and witnessed. But our community slept through it all. Where were all the doubting Thomases, where were our great scholars and lecturers, where were our so-called Akabars and the magnificent seven of the Punchayet? How many applauded and rewarded the labours of these two young priests who worked day and night to make this happen? How many thanked our senior priests and Dasturs for their guidance and insight? Did this make it to the pages of our community newspapers? No. Because we are more interested in so called ‘youth meets’ where Parsis parade about in so called fashion shows, displaying bodies without Sudreh and Kusti. But I want to reassure these young priests and my readers that their labours will not go in vain. Nature watches everything and surely they will get their just rewards from Nature in a form they never expected. Every ceremony done using the Varas of this new Varasyaji Varzavand will shower a special blessing to all those who were involved in this majestic event. The Parsi Zarathushtrian faith is alive and kicking, and will continue to do so till the advent of the Promised Saviour Shah Behram Varzavand, in whose name this new Varasyaji was consecrated. May that day come soon! What a wonderful article, Dasturji. It is indeed a pity that this event went unheralded. I would like to thank you for making us aware of this event and sharing the inner workings of this powerful religious ceremony. As always a beautiful article that explains a very important ceremony in lay man terms. May I have your permission to publish this in our local newsletter? I am in Texas and we have an associaion called Zoroastrian Association of North Texas. I do not know if the board members will see fit to publish it ot not but I would like to have youe permission just in case they decidethey would. Very informative – the entire article on the Varasriaji. Some friends who were sceptical about us using the Bull’s urine for ceremonies now understand thanks to the simple wording and matter of fact way of the article. Thank you very much. We are fortunate as a community to have Dasturjis who can undertake such complicated and back breaking tasks. May Ahura Mazda bless them and increase their numbers so that our community can keep on benefitting from their knowledge and industry. I’m in Australia, and fortunately, your website is my eyes and ears to such community celebrations and Khshnoom at the moment. The Parsi family in Amalner is my great-great grandfather’s family (Behesht Beher Behramshah Cawas Bharucha). Over the past many years one of his gradsons Noshir Bharucha has provided our community with many suitable Varasyajis. I only hope to be helpful to our community like my family. Thank you for sharing this information. THANK YOU SO MUCH FOR SPARING TIME TO TEACH US THE ESSENCE OF OUR RELIGION . ALTHOUGH I AM A SENIOR CITIZEN TILL READING THIS VERY INFORMATIVE ARTICLE WAS NOT AWARE OF THIS BEAUTIFUL CEREMONY WHICH OUR SPIRITUAL VARASYAJI HAS TO UNDERGO.AND KUDOS TO OUR PRIEST WHO PERFORM THE BEAUTIFUL CEREMONY OF PURIFICATION. I WILL SEND THIS EMAIL TO MY 2 SONS N DAUGHTER WHO ARE ALL LIVING ABROAD WHO WOULD ALSO GET TO LEARN AND SPREAD THE BEAUTIFUL ESSENCE OF OUR RELIGION. The enlightenment article on the ‘consecrated of Varsiaji’ is well impacted among the Zoroastrians. Your satire on Panchayet’s trustees was very apt. But late my Ustad Sahib Minocher Rustom Soonawalla gave me an advice ‘ never say mey kedhu, me kedhu’. ‘Mey mey to bakri bole’. The duty on Dasturs’ assigned by Spitam Zarathustra Sahib is to serve the ‘Dharma’ without asking any reward from mortals. I agree in that it should have been celebrated, however WAS THE DATE PUBLICLY ANNOUNCED IN ADVANCE? I am grateful to have learnt about this historic event from your post here. As President of the Zoroastrian Association in Pittsburgh, i will certainly announce it in our next newsleter. Thank You. Thank u very much for this lovely knowledgeable article I will surely forward to my parsi friends. God Bless U and the two priests who have performed this beautiful ceremony. Thank you very much for informing our community about the consecration ceremony of Varasyaji, Varzavand, and also telling about the elaborate ceremonies involved in doing the same. I would like to thank Ervad saheb Asphandiar Dadachanji for fining and transporting the new bull to be consecrated,and to Ervad Sahebs Darayus Karanjia and Kaizad Kotwal for the consecration of Varasyaji.Lastly i am thankful to all those involved in helping to consecrate the Varasyaji. Are there special people to take care of the Varasyaji? Are priestly class only permitted to tend to him or can behdins also do the same? Any Parsi can take care of the Varasyaji. These are dedicated volunteers. They need not belong to the Athornan class. Was Darabshah Masani related to Cawasji Masani, Baji and Soli Masani? Our priest here in California was very good friends with the Masani family and he frequently talks about them. He says Cawasji and Baji were very noble souls, and a great loss to humanity. Well said, Ervad Hathriram. God Bless you and yours. At the Cama Baug Agiary.